An increasing number of security flaws in the Android open platform have led to experts raising questions over the security and privacy afforded by the Google OS, as some new security vulnerabilities have recently been discovered in several of Android models manufactured by HTC, adding to the increasing numbers of malwares and viruses for Android. The latest versions of HTC’s proprietary Sense UI gives the applications which are installed on handsets including the Thunderbolt, Evo 3D and the Evo 4G access to the personal information of the users. According to an expert, this data includes phone numbers, text messages, user IDs, locations and more such details which result in a very serious security breach. If the security exploit can access such sensitive data, this could have serious implications for privacy concerns among Android users, especially as mobile payments and banking are on a rise with smartphone users. The potential results of a data theft range from identity theft to unauthorized charges appearing on phone bills. The increase of these instances will also hamper the popularity and reputation of Android, both with the users and manufacturers. With a 39% share of the smartphone market, Android smartphones currently lead in their category; however the closest rivals like Apple’s iPhone devices and Research In Motion’s BlackBerry smartphones are not much far behind. In other respects, more than 50% of the revenue which comes from the sales of mobile apps comes from Apples iOS based devices. If Android handsets create an impression of being unsecure for the users in such a competitive market, it may result in them moving towards the platforms such as iOS which are considered more secure. However, it has been discovered that many users prefer Android over the Apple platform as it is an open OS, whereas the Apple iOS despite being more secure is also very limited. The same is true with the marketplace for Android apps, which despite being less secure than the Apple counterpart, provides users with more options to customize their devices. While responding to the alleged security vulnerabilities, it was stated by HTC yesterday that they are currently investigating the authenticity of these claims, but they haven’t acknowledged the presence of any such flaws yet. 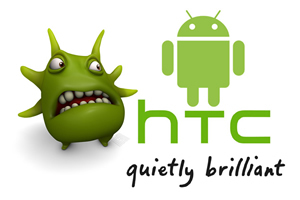 These problems with the HTC handsets comprise the latest of the steadily increasing malware problems for Android over the last couple of months.